Ancient Egyptian "Amun Offertory Relief"
The above listed item is from the Middle Kingdom Period,(2040-1782 B.C.E.). This "Amun Offertory Relief" is carved from limestone. The god Amun is depicted here seated on a throne holding the royal crook staff. 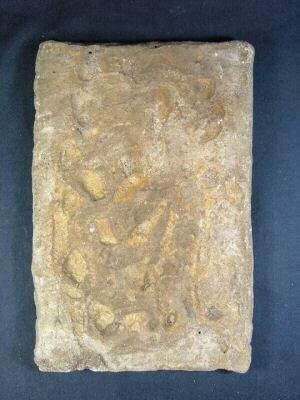 This figure was probably associated with a Pharaoh from this period. There is a priest standing in front of an alter preparing an offering. In the background there are faintly visible pillars of a temple and there is also a Horus falcon behind the seated Amun or Pharaoh. 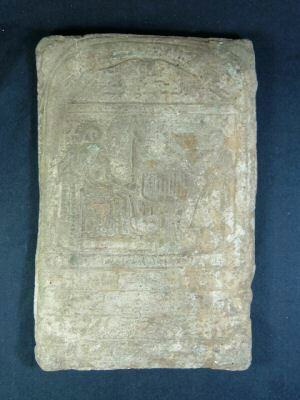 This fragment of a larger panel is intact and has age wear. This is a very unique and very rare piece of antiquity! The reason for the item being available is due to the vast extent of archeological findings, thousands of years in Egyptian burials and also the proliferation of these said items in older private collections worldwide.